Home Blog Apple Mac Is it better to lease or buy a computer? Is it better to lease or buy a computer? There are so many makes, models, styles and sizes of computer, with seemingly constant upgrades coming onto the market. Rapid technological changes and innovations mean that a model could become obsolete in a relatively short space of time. With the prospect of regular upgrades a reality for users, many are turning to leasing, ensuring they are equipped with the best possible technology. But which is better, leasing or buying? The former means users keep up with the latest technology, but don’t own their device outright. Meanwhile buying outright means the computer is the user’s to do what they want with. Buying tech is tempting, and there are many reasons for this. With buying, there is a bigger market to purchase from, and people often think that if they look hard enough they might bag a deal. Others like to visit bricks and mortar shops, actively making a purchase purely because it’s enjoyable, or because it makes them feel safer. Taking out a lease is often done online, yet not everybody likes to do this, without ‘seeing’ the product first. None of these reasons are definitive, and are based more on personal preference. With this in mind, buying your IT hardware outright actually poses some big disadvantages. As the market is so big, how do you know you are paying the right price? A few weeks down the line you might find you could have got a better deal elsewhere. You also have to ask yourself if your expensive purchase is going to last the test of time. It might continue to work for a long time if you’re lucky, but when you consider speed, installation of new updates and software – not forgetting style – you’re probably going to get two or three years’ use out of the machine on average. This is particularly true for businesses that need lots of consistently high-performing machines. Only big cash outlays every few years will prevent you from being stuck with yesterday’s technology, and the reality is that few of us can afford to do this. This is where leasing steps in. Leasing isn’t new. Everybody leases their mobiles nowadays and vehicle leasing is commonplace. So leasing a computer seems like a natural progression. 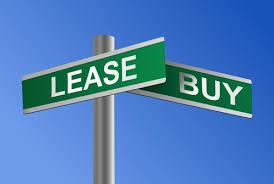 So what are the benefits of leasing? How does it differ from buying your own tech? Well, like your phone, you get the opportunity to renew or upgrade after a certain period of time – usually two years. This means you can have – and keep having – the latest equipment. Having to work with outdated technology is no longer a worry. As you are paying monthly (or weekly, quarterly, annually) for your computer, you get to keep the cash that you would have otherwise spent on purchasing outright. If you have a big business with many employees using computers, this might be a large amount of money that can be spent elsewhere, such as on advertising or marketing. What’s more, leasing does not affect bank borrowings and can be deducted from your taxable income, enabling you to budget effectively. These advantages also make leasing a great option for new businesses that are limited financially. Not only are computers expensive, they can also be unreliable. Whilst outright purchasing often comes with warranty, you may still be left to fix problems, particularly when the warranty runs out – and we all know that repairs can be expensive. Leasing can reduce this worry as it often comes with warranty, technical insurance and insurance. With leasing, you do eventually get the option to own the equipment and are then free to take out a new lease. Old equipment can be used elsewhere – it can be taken home for the rest of the family to use or can be kept within the business for new staff. Technology is moving much faster than many of our finances can allow; yet the reality is we cannot live without it in our personal or professional lives. It’s for this reason that leasing should be a serious contender for individuals and businesses alike, who perhaps can’t or don’t want to continue spending hard-earned cash on buying upgrades outright.